기사요약: 북한이 11월 29일 오전 3시 17분께 평남 평성 일대에서 대륙간탄도미사일인 화성-15형을 발사했다. 지난 9월 중장거리미사일(IRBM)급 ‘화성-12’형을 발사한 지 75일만에이며 북한 측에 따르면 이번 미사일의 최대 고도는 4,475km, 비행 거리는 950km다. North Korea abruptly ended a 10-week pause in its weapons testing Tuesday by launching what the Pentagon said was an intercontinental ballistic missile -- apparently its longest-range test yet -- a move that will escalate already high tensions with Washington. The launch, in the wee hours Wednesday in Asia, is North Korea’s first since it fired an intermediate-range missile over Japan on Sept. 15, and it appeared to shatter chances that the hiatus could lead to renewed diplomacy over the reclusive country’s nuclear program. US officials have sporadically floated the idea of direct talks with North Korea if it maintained restraint. An intercontinental ballistic missile test is considered particularly provocative, and indications it flew higher than past launches suggest progress by Pyongyang in developing a weapon of mass destruction that could strike the US mainland. President Donald Trump has vowed to prevent North Korea from having that capability -- using military force if necessary. 내용요약: 유럽외교관계이사회가 최근에 북한의 미사일 표적들을 알아냈다는 보고서를 발표했다. 미사일 표적 리스트에는 청와대와 미국의 백악관, 미국과 한국의 주요도시들이 포함됐다. 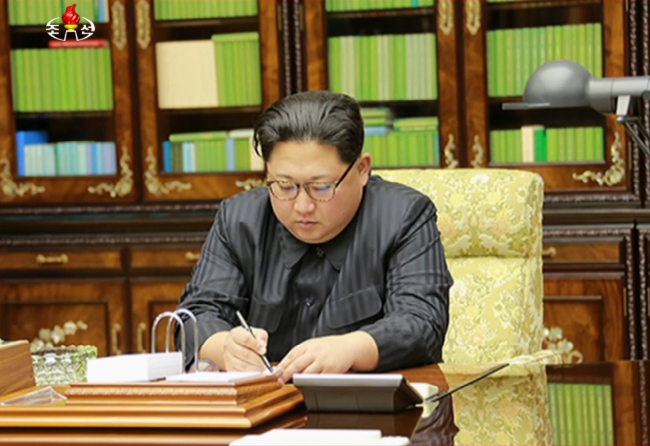 North Korea’s nuclear and missile hit list includes Cheong Wa Dae, the White House and major cities in both South Korea and the United States, a European think tank report said. “North Korea lacks a clear distinction between the use of nuclear weapons against military targets and their use against civilian targets, or any plan for a gradual escalation from attacking military bases to striking cities,” the European Council on Foreign Relations said in a recent report. The South Korean military said Tuesday it is keeping close tabs on the North for signs of its next provocation, in collaboration with the US.